a peptide released from vascular endothelial cells and other cells in response to hypoxia, ischemia, or hypoglycemia. VEGF promotes angiogenesis. Interaction of VEGF with VEGF-2 receptor induces the full spectrum of VEGF biologic responses in endothelial cells, including permeability enhancement, cellular proliferation, and migration. VEGF is released continuously to maintain the survival of the microvasculature of a tissue. Inhibition of VEGF production by hyperoxia results in regression of surplus microvascular elements. a peptide factor that stimulates the proliferation of cells of the endothelium of blood vessels. It promotes tissue vascularization and is important in blood vessel formation in tumors. It exists in four forms with different lengths (121, 165, 189, and 206 amino acids). Levels are elevated in hypoxia. 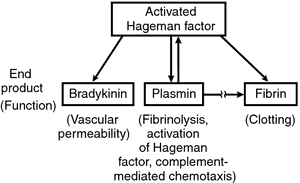 Also called vascular permeability factor. Peptide released from vascular endothelial cells and other cells in response to hypoxia, ischemia, or hypoglycemia. A naturally-occurring POLYPEPTIDE of between 121 and 206 amino acids. It occurs in four forms, the commonest of which has 165 amino acids. VEGF promotes the production of tiny new blood vessels by stimulating the growth, migration and proliferation of endothelial cells. It increases permeability of existing vessels and causes widening of blood vessels through the mediation of NITRIC OXIDE. Local shortage of blood supply (ischaemia) increases the gene expression of VEGF. Chronic lymphocytic leulkaemia B cells resist apoptosis by secreting and binding VEGF. VEGF in retinal ischaemia is believed to be the basis of one kind of AGE-RELATED MACULAR DEGENERATION (ARMD). The drug pegaptanib that opposes VEGF has achieved some success in treating ARMD. Ovarian steroid regulation of vascular endothelial growth factor in the human endometrium: implications for angiogenesis during the menstrual cycle and in the pathogenesis of endometriosis. Vascular Endothelial Growth Factor Related Pathways in Hemato-Lymphoid Malignancies Journal of Oncolgy. Imatinib mesylate (STI571) decreases the vascular endothelial growth factor plasma concentration in patients with chronic myeloid leukemia, Blood 2004; 104 (2): 495-501. Pathogenesis of macular edema with branch retinal vein occlusion and intraocular levels of vascular endothelial growth factor and interleukin-6. Expression of vascular endothelial growth factor mRNA in non-small-cell lung carcinoma. Vascular endothelial growth factor is inactivated by binding to [alpha]2-macroglobulin and the binding is inhibited by heparin. Identification of a natural soluble form of the vascular endothelial growth factor receptor, FLT-1, and its heterodimerization with KDR. Expression of vascular endothelial growth factor and thrombospondin-1 mRNA in patients with endometriosis. Novel polymorphisms in the promoter and 5' UTR regions of the human vascular endothelial growth factor gene. In vitro assays and in vivo animal studies have shown that binding of ERBITUX to the EGFR blocks phosphorylation and activation of receptor-associated kinases, resulting in inhibition of cell growth, induction of apoptosis, and decreased matrix metalloproteinase and vascular endothelial growth factor production.